Congrats, Mr. and Mrs. Semblat! 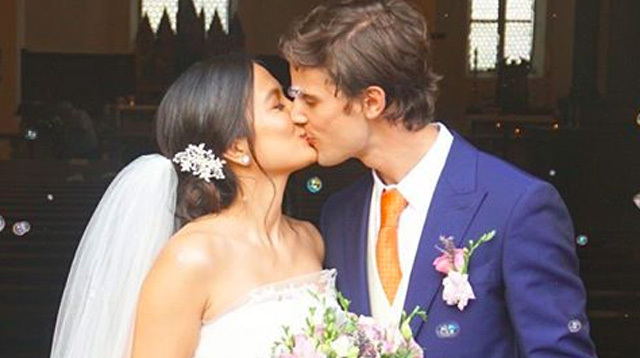 Isabelle Daza and Adrien Semblat have finally tied the knot in Tuscany, Italy! The long-time couple celebrated their ~*love*~ during a three-day wedding weekend in the Italian countryside with their family and very famous friends–Anne Curtis, Georgina Wilson, Liz Uy, Solenn Heussaff, Bea Soriano, BJ Pascual, Raymond Gutierrez, Tim Yap, Rajo Laurel, and more! The festivities started off on Friday night with a welcome dinner for the guests + despedida de soltera for the bride. The intimate party was held at the Castello di Gargonza hotel. The next morning, friends of the bride and groom helped set up the wedding reception venue with very personalized touches. Love is in the details! After lunch, the guests then headed to the Comune di Lucignano where the afternoon nuptials would be held. She was then escorted by her ninong and late father’s best friend, Senator Bong Bong Marcos. Belle and Adrien’s seven-year love affair was then sealed with a kiss!